Engineers Week. You know it. It’s the third week in February dedicated to educational outreach and a celebration of the role engineers play in the world around us. 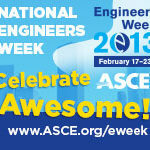 ASCE members have been organizing ‘EWeek’ activities for years! However, this year, getting ready for Engineers Week may look a little different. The National Engineers Week Foundation – the center for Engineers Week, Introduce a Girl to Engineering Day and a wide portfolio of programs supporting volunteers in engineering outreach and celebrating engineers – is now DiscoverE. Often with rebranding efforts, people will ask, “if all the programs are the same, then why the change?” Let’s unpack this question and see what the top three benefits will be for ASCE outreach volunteers. Visibility. For years, volunteers in the engineering community have wondered why we call it Engineers Week, and then proceed to promote its programs all year? In short it’s because over the years, the Engineers Week Foundation added new programs, and as these programs became established, they each sported a different logo and therefore seemed to be their own independent program. With the new brand identity, ASCE members will know that their favorite program is a part of one larger movement – DiscoverE. Access. Where do engineers go for the resources usually associated with Engineers Week, Girl Day, and Future City? In the past, many places, but with the name change, a new www.discovere.org volunteer center has been created to support the engineering outreach and education communities. DiscoverE programs, online workshops, and resources are now housed in one easy to use online destination. Purpose. With the many programs of DiscoverE, comes one unified purpose: celebrating and advancing the critical and often overlooked role engineers play in our country’s innovation economy. DiscoverE’s tag line, Let’s Make a Difference, showcases this mission and is a call to action to our community of volunteers and educators to nurture and grow the next generation of engineers and technicians. Next time you see DiscoverE, you will know that as outreach volunteers you are part of a wave sweeping the country that is visible, accessible and supports a common purpose. Whether the activity is Engineers Week, Introduce a Girl to Engineering Day, Future City, New Faces, Global Marathon or DiscoverE Recognition Programs, the impact is great – Your volunteer effort is helping the public, and especially students, Discover Engineering and helping to shape the future of engineering for the next generation.